Review of the September 2016 City and MassDOT presentation of the plans for the North Washington Street Bridge show just how positively the southern border of the Rutherford Corridor will be transformed in the near future. It also shows how the plans could align with the future of Rutherford Avenue, but do not as yet. The image below is intended to show the dedicated bus lane southbound from the Tobin Bridge off ramp (see red line), but it also offers a lot of information about the northbound lanes too. Northbound, there will be 2 lanes and a right turn lane. The right turn, where cars move very quickly at the same time pedestrians are trying to cross today, is made much safer by making it a regular 90 degree turn. That, plus the narrowing of the lanes from three to two, allows the sidewalk to get a lot wider - and the outdoor diners at Blackmoor Bar and Kitchen to be much farther away from moving cars. The above visual is from the bridge design effort. If you look just above City Square Park (the green square in the bottom corner), you see a white hashed shape. That is where the open space would be located once Rutherford is 2 lanes wide, but in this graphic, they are marking it with painted lines so vehicles do not drive there. There is also a small note in a box that says "bike lane ends". 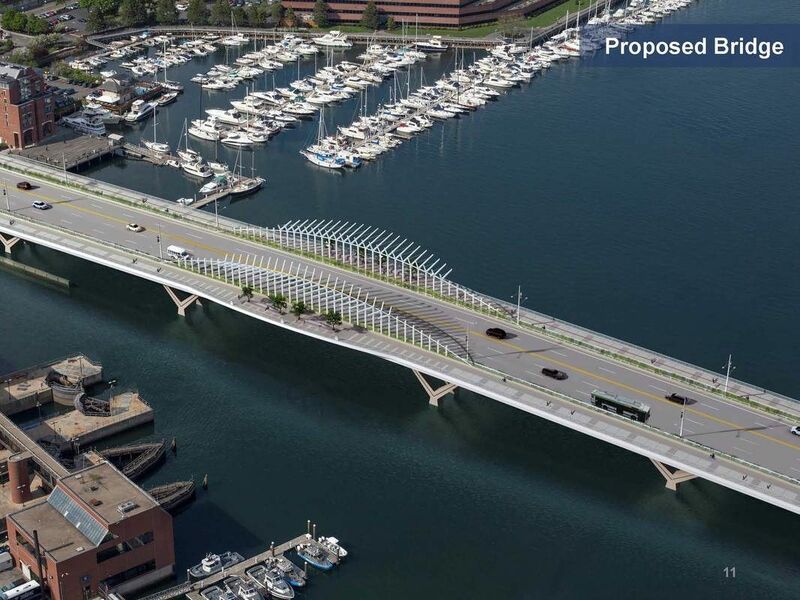 Until the Rutherford Avenue project is completed, pedestrians and cyclists who cross the outstanding, pedestrian- and bicycle-friendly bridge will meet up with today's auto-dominated Rutherford Avenue as they cross Chelsea Street into City Square. The May 2017 visuals show a shared use path in light blue, a sidewalk in dark blue and green space adjacent to City Square park and running the length of Rutherford Avenue up to Austin Street. The triangular shaped green space is the area in front of the gas station. Old Rutherford Avenue can be seen in the upper right and a significant open space buffer is added between the condos abutting Rutherford Ave. In the Underpass Option 2017, there is a shared use path shown, but no sidewalk. That means that cyclists, joggers, and walkers will share the same space. There is a modest amount of space (perhaps 5-10 feet) for some landscaping.